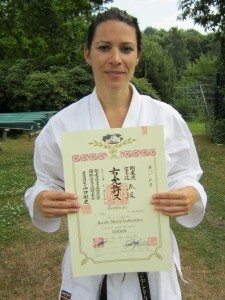 Gojukai Europe now got their first female 5th Dan Senseis! At the European Gasshuku this year in Holland, Nicole-Marie van den Dries Luitwieler (Holland) and Doris Gwinner (Switzerland) graded for Godan. Click below to find out more! Sensei Nicole-Marie were also working with the arrangements of the seminar, and all participants from Sweden can agree that it was a success. We truly appreciate the efforts that were made to find a suiting place and a specially welcoming atmosphere for the families with children. Sensei Nicole-Marie were very kind to take her time and answering some questions about her training, every-day life and what kept her motivation up for 28 years in the dojo. Read this – and get inspired! – How come Sensei started to train karate-do? And can You still remember the first visit to the dojo? – I still remember that I attended a karate training as a 5-year-old girl and how impressed I was. I immediately asked my parents if I could also train karate. Unfortunately there was no karate club in my area that taught children. To compensate for this, I trained Judo for a number of years. Looking back it turned out to be good for my development, but it wasn't what I really wanted. – How old were Sensei when You started Your karate career? – When I was 12 years old I could finally train karate. From the very first lesson I knew this was what I wanted. – What made Sensei continue from there with the training? – What appealed to me greatly was the graceful way of moving, especially in kata. I looked up to the karateka with a higher grade and wanted to move like them. – Sensei have spent many years in the dojo now, how have Your motivation and view on karate-do changed over the years? – Over the past 28 years I continued training karate and it has always been an essential part of my life. At the same time I experienced different types of motivation. When I started karate I just wanted to move as beautiful as my role models in karate. At a later stage competition was an important driving force. But winning has never been the only focus. I experienced the comparison with others as a powerful tool to develop myself and getting better. – Training for a grading is hard work. You have to be resolute and disciplined, what are Sensei's thoughts now that You have passed the test? – Surely the participation of women in karate is also of particular concern to me. Passing my Godan exam this European seminar, I hope, will be a stimulus for other women to continue training and to develop themselves in a martial art which is still male-dominated. I truly believe karate is one of the most empowering sports a female can participate in. – What is the most rewarding in living with karate-do for Sensei today? – The last few years teaching youth gives me great satisfaction, particularly children with disabilities. I believe martial arts can make a significant contribution to the self-development of these young people and can be a support in becoming independent. Some 4 years ago I set up a special karate group for children with disabilities. To impact these youngsters confidence through training karate is incredibly rewarding for me. – What is Sensei's profession outside the dojo? – Besides my karate training and teaching I have my own business and I work with people with disabilities. For example, I give courses in special needs schools and try to help youngsters to develop social skills and build up self-esteem. I train both the students and their teachers and provide advice to the parents. During these courses I also work together with healthcare institutions. My lessons are mentally and physically oriented and I use many principles from karate. – Is there any quality as an instructor You need more of working with disabled children? – I believe teaching children with disabilities entails specific requirements. Creating and maintaining a positive learning environment geared toward these youngsters is an absolute must. Through education (e.g. pedagogue and physiotherapist) and experiences I became more aware as a trainer in order to understand the needs of these children. – Me and my husband have two children, and both of us like to keep up with our training and teaching in the dojo. In Sweden, many women unfortunately give up their karate-training when having kids, what is Sensei's view on this situation? – Together with my husband (Jan van den Dries Shihan) we have a 10-year-old daughter, Yrsa. She was born with severe physical and mental disabilities. Despite taking care for her is sometimes very hard to combine with training, teaching and working she is also my biggest motivation. I keep training and developing myself to stay a fit and happy mum. At the same time I credit my husband for supporting me in many ways. I am sure that his back up is an essential precondition to realise my aspirations. – Is it possible to make it easier for both mothers and fathers to keep up their training? – As a board member of the Dutch Gojukai Association I strongly support the idea to involve children and partners of our members in karate. So we organize many activities where they are welcome and can participate in different ways. – Does Sensei think there are any need for special support to encourage women to keep up their commitment to karate-do and to advance further in the clubs and our organisation? – I recognise the importance to get sympathy and support from your family for your karate practice, in particular women with kids. Therefore this European Gasshuku we focused not only on participants but on whole families and we organized a youth programme with special classes for children and non-training kids were also allowed to join different sports activities and games besides the trainings. I believe it is important having goals which motivate you to pursue your passion. In addition to personal goals I have also been committed to the Dutch Gojukai association concerning professionalization and increased women participation. – Have Sensei learned anything special from the years with karate-do that You have benefited from outside of the dojo? – The most striking lesson I have learned over the last few years is the importance to incorporate people, give them responsibilities and work together to get the best outcome. – And what about the karate-future? Does Sensei have any specific plans? – In the future I expect still to be involved in karate, but I hope to delegate more responsibilities to younger people. I think that’s the essence of building up an organization. I sure hope Sensei will stay active in Gojukai for a long time, and keep on being an inspiring role model for the rest of us. All the best wishes for the future!